This is the recipe I use to make gluten free dairy free basic sandwich bread for my family every week. Enjoy! This month, Karen of Cooking Gluten Free challenged us with bread. You know, that stuff you gave up on when you became gluten free, that stuff that is ridiculously expensive if you by it pre-made (and is a bit of a dry disappointment, if you DO buy it). Yeah, that stuff. The ratio for gluten bread is 5:3 (flours to water). However for gluten free bread, I do not find that to be the case. Gluten free works much better if you start with a wetter dough. My ratio works out to be about 2 parts flours and starches:1 part liquid:1 part eggs or flax egg replacer. For those of you wanting a chick update, our chicks are 2 weeks old today. 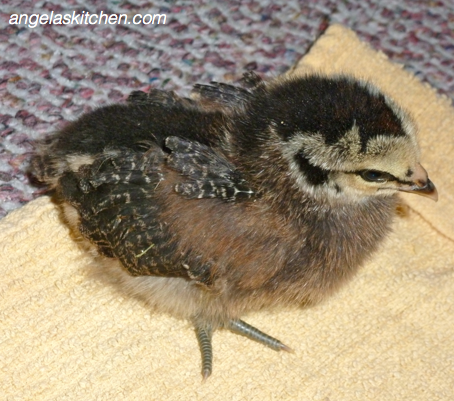 They have progressed in feathering to have little epaulettes on their shoulders. So cute! I make a sponge with part of the ingredients and let it rest for 2 hours to overnight. I do this with most of my breads. I think it adds a better flavor, texture and evens out some of the flavors of some of the gluten free flours. Try it with your bread recipe. You will be surprised how much this technique changes things! 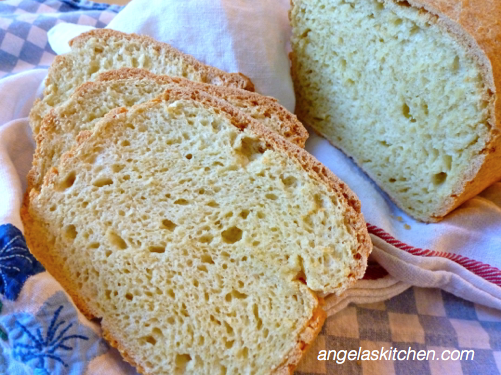 This is the base gluten free dairy free bread I make every week for our family. I change it up when we need variety. In a non-reactive bowl, combine ¾ cup milk substitute, garbanzo flour, sorghum flour, yeast, sugar, and cider vinegar. Mix well. Cover bowl and set aside for 2 to 4 hours. In the mixing bowl of a heavy-duty mixer, beat eggs until frothy. Add oil, blend. Add garbanzo flour mixture and stir well. Wisk dry ingredients together in a separate bowl. Add dry ingredients, mix well on low speed until all ingredients are incorporated. Check texture of dough. If needed, add 1 Tablespoon of milk substitute at a time until the correct texture is achieved (not too stiff, not soupy – thick and sticky). Beat at high speed for 3 minutes. Scoop dough into an oiled 8 inch x 4 inch bread pan. Smooth dough with oiled hands. Let dough rise in a warm area, covered with oiled plastic wrap for 20-45 minutes. Do not let dough rise past top of pan or it will be over proofed. Bake in a preheated 375 degree oven for 50 -60 minutes. If the crust is browning too much for your taste, set a piece of foil over the top of the loaf during last half of baking time. Wonderful! I'm so impressed that you make bread each week - I really need to work on baking more so I can get there with regular bread baking - lovely looking loaf! Your ratio looks very similar to what I ended up with. I love the rise on your loaf! You're bread looks gorgeous! Now I want to check out all the variations you make from it. (Three loaves a week? Impressive!) But what I'm really in love with are your chicks. We've got six of our own (three Araucanas and three Silver-Laced Wyandottes) that just turned 5 weeks old today, and it has been such a sweet adventure watching them grow and come into their own personalities! Yours are adorable! "Everything is better fresh from the oven and made with love" - totally second that. Beautiful words to go with a beautiful bread recipe. Thanks for sharing! I bake up bread for my family every weekend, too. What a great way to prepare for the coming week! Thank you for including an egg-free version of this bread, it looks wonderful! Hi, Nina! Alrighty, the Swedish Limpa version is up. Thanks for being patient while I was having oven issues. :) Enjoy! I am just seeing this... I wouldn't use rice flour as it doesn't have the protein that the bean flour does. I haven't tried another flour to replace that one in this recipe yet, so you could try it (or millet flour, sourghum, aramanth, or a combination) with the understanding that it may change to texture of the bread dramatically. It you want to try it still, try baking the batter in 3 mini loaf pans instead of a larger loaf. When cooled, cut the bread the long way for a regular sized piece of bread. You will have 6 end pieces, but the extra crust created by baking in the mini pans will give the yeast bread support, giving a better result while learning the quirkiness of gluten free yeast bread baking. I baked my bread like that for 6 months when I first was diagnosed! Yeast breads are a bit of a learning curve, so if it does get wonky, you can still use the loaf as bread crumbs and the like. Hope that helps! We have only been gluten/dairy free for 2 months, due to allergies. I have been looking for a basic, everyday sandwich bread that would satisfy my sons (10 & 11). I didn't expect to have any trouble with gluten & dairy free recipes. I am an excellent baker and bake almost everything my family eats because it is much better than store bought. They will eat store bought cakes/cookies/pies if they must. However, I honestly don’t think some bloggers even try the recipes they post. They are horrible! You have restored my faith in bloggers with your bread recipe. It did take me a couple of tries. The first two tries I was not getting the consistency correct. I need to add a little more liquid which you stated might be needed. It took me a couple of tries to “eye ball” the correct consistency. The first attempt was inedible, the second my family said was good but I wasn’t happy with, the third batch was perfect in taste but not shape. I do think that this recipe is probably best in a smaller bread pan than the ones I own. I only have large ones that I have previously used for sweet breads. I have bought smaller bread pans ($1 each) and will bake 3-4 loaves this weekend for my family. have you ever tried making sourdough with this recipe.. we have a sourdough starter and I was just curious if that would work?